In the 1960 there as a very popular sci-fi series about a family struggling for survival in the scary outer space. This is the remake, again produced by the 20th Century Fox. Where can you stream Lost in Space? 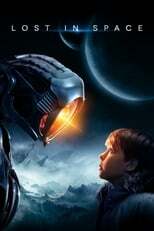 On 2018-04-13 Sci-Fi & Fantasy/Action & Adventure TV Series Lost in Space first aired on Netflix. Written and created by Matt Sazama & Burk Sharpless, and produced by Legendary Television & Synthesis Entertainment, Lost in Space will return and was last broadcasted on 2018-04-13.